… for 26 miles, 38 yards. What could be simpler? My third LM and the first flying club class, courtesy of the TV Times/Leukaemia Research team. Didn’t make the running any easier, of course, but at least I’ll be able to tell the grandchildren I once shared a tent with Sir Matthew Pinsent, James Cracknell – and Joe Pasquale. Kinda cool, too, meeting at Marathon Central, the Tower hotel, and sharing a lobby with the elites, who are quite magnificent running specimens close up. Like us, they carry bottles of magical elixirs at all times; unlike us, they appear to float above rather than merely walk on the ground..
Coach ride to Blackheath, with much banter between thesps, winding each other up and fretting about pace, gels, safety pins. Disembarkation outside the Clarendon hotel, but not before passing the red start and seeing the great gathering of the clans. Felt thoroughly spoiled. Forty five minutes more faffing, lubricating and faffing, then a team photo. Yes, that is Tony Audenshaw, Bob Hope from Emmerdale (if you want to tell your nan) dressed as a fairy down at the front. But, before you scoff, you might like to note he did 3:18 in that wig; and he eats up ultras, fell runs and all kinds of grown up stuff. Just thought I’d mention it. Across the heath to the Sleb tent – which was a tent with some nice loos out the back. Super model Agnyss Deyn looked very young, Sir Matthew looked very chunky and Cracknell looked like a god. Joe Pasquale, in a loose grey track suit, looked like he was on an ASBO. Paps papped, slebs stretched and harried BBC producers squinted at me occasionally before concluding that I was nobody special. 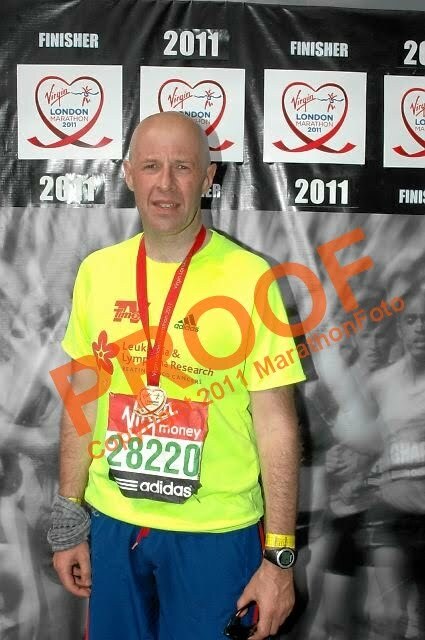 See if I care, I muttered to myself: I’m starting the London marathon at the start. 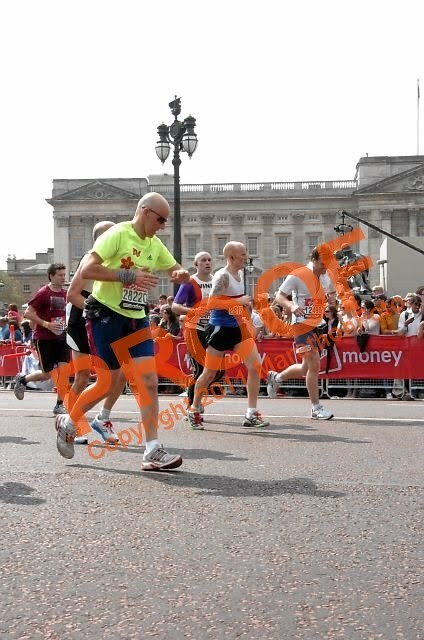 I crossed the line at 9:45:05. I was aiming for 3:45, which meant a steady 8:30 min/mile pace. What did I do? The first 5k sub 8. Doh. And I really tried to hold myself back. Felt so good to be running after the taper, and trotted past GB Olympic 400m runner, Iwan Thomas, who’d spoken at the expo about setting off too quick. He was really plodding this time, but I wasn’t that much quicker. Hit the 10k around 50 mins (8:10 pace) and felt cheerful about reaching Greenwich and my first supporters. A bit less cheerful when I missed them (they saw me, apparently) but I was again grateful not to have been caught in the Deptford bottleneck. My pacing was all over the place, as I tried to find a rhythm swinging between 8 and 9 min miles over the first half. Around 8 miles I heard a familiar sound: the “chuff-chuff” of the Steve the Steam Engine. Of all the places in all the races …. Yup, it was him, looking unstoppable. We attempted a handshake (more complicated than docking a space station, it turned out ) and he was off. I put him down for 3:30, no probs. I kept my modest gains in the bank, and crossed the half way point at 1:49, which had me three mins up on my target. A highlight was seeing the other side of Commercial Road empty, then spotting the outriders, pace truck and finally Mutai, striding past at 13 mph. Like a kid spotting his footballing hero, I felt real goosebumps and called out loud “Awesome!” The guys around agreed. Just phenomenal to see them move up close. 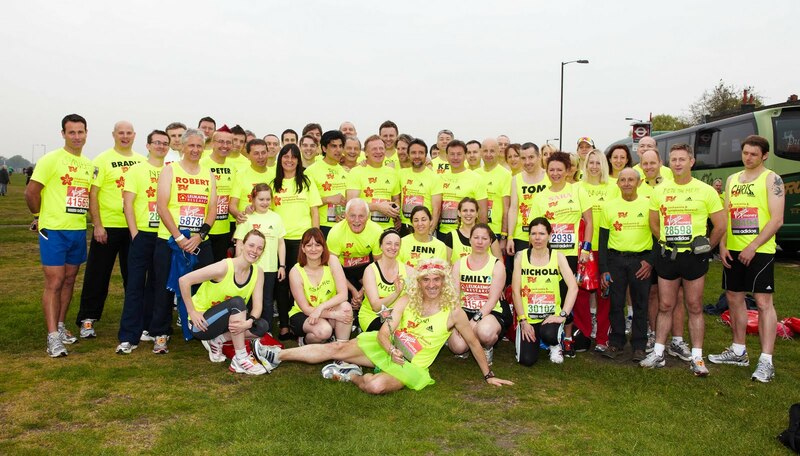 My next treat to look forward to was the Clapham Runners posse, who whooped up a storm and lifted me higher. I was pleased with myself that I’d arrived on schedule (thought I’d get a tick from Frank for that) and headed into the Isle of Dogs, or the Death Star. Which turned out to be more cheerful this time. There’s one obvious difference about running at 8:30 min/miles rather than 11 min/miles, my first year pace: it’s over sooner. And I seemed to be passing the 15,16,17 mile markers at a decent click. A mate whooped me up at St Katherine’s dock, another at South Quay and I was at Canary Wharf in one piece. Clinging onto sub 9 miles, but in one piece. T-h-e-n – i-t – a-l-l – s-l-o-w-e-d – d-o-w-n.
Somewhere around 19-20, just like they say in all the books. It didn’t feel quite like The Wall, but maybe it was, despite a litre of fluid and gels every thirty minutes. I just couldn’t get my legs to go any faster. I was determined to put on a brace face for the CR congregants at 21 and remember trying to wipe the sweat off my face, but Martin’s photo tells the real story – those puffed out cheeks belonged to a puffed out Ant. Wished I’d been wearing a CR shirt, though. Tony the ultra-running fairy had given us all a tip on the coach: the last bit is just about battering the legs. They want to stop, you don’t, so give them what for. Push on. Swing your arms, get your heart rate up. If everything else is OK, just batter your legs. So I tried. I focussed on a green traffic light way down the road and ran to it, ignoring the requests, then the demands of my quads to stop this nonsense. I found myself using quite strong language towards them, which drew the occasional glance from my fellows, although I was just saying out loud what they must have been thinking. Then the blister joined in. I looked forward to junking these 9 1/2 shoes and moving permanently into 10s. 21 s-l-o-w-l-y became 22 became 23. 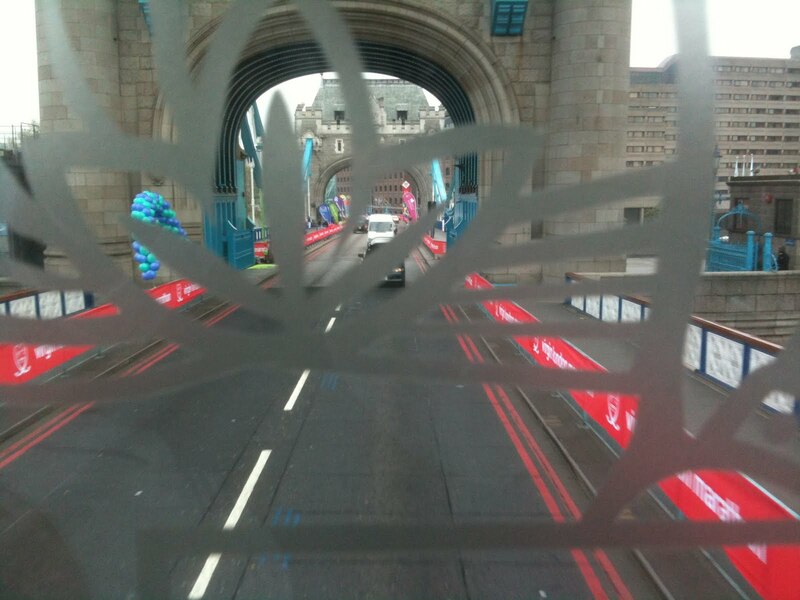 Hitting Tower Bridge was a kind of relief, but I knew my pace was slipping and now I just wanted to cling onto the 3:40s. Coming up from the Blackfriars underpass around 3:35, I knew I had to dig in, so the polite conversation between my legs, toes and I continued up to Big Ben, where I saw my son brandishing a sign I couldn’t read. Another oddity: for the first half, I tried to stick to the elite course blue lines, which sometimes required some robust footwork (I wasn’t the only guy with that idea). By the end, I couldn’t find them, for the life of me. The brain goes to funny places under stress, I guess. I turn the corner, there’s the clock and it’s a dash to the finish. Thank you Jon Munroe for all those sprints, because I got there, with 11 seconds to spare. I come to a dead stop off the mat. Not another step will we run, the quad/blister committee insist. Beat Iwan Thomas. Beat Jamie Baulch. Beat Michel Roux Jr (with shin splints and sciatica but, I’m taking it). But, most of all, beat bitching quads. Although running is a solitary experience, there really is such a thing as team spirit, and I was genuinely invested in Steve’s, Lizzie’s and Sinead’s success. Piqued, obviously, to be pipped by Lizzie, but humbled to hear she’d run most of the race with a sprain. I’d never have taken an hour of my LM time in two years without you, Clapham Runners, so I thank you, one and all. And, remember: they also serve who only stand and wait. ← (Member blog post) Ariiiiiiiiiiibbbaaaa!! Maraton de Madrid!